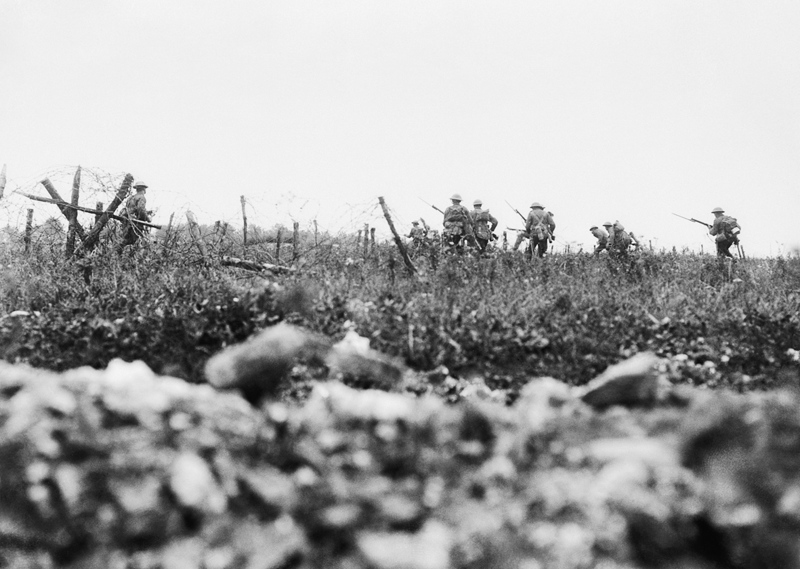 November marks the centennial anniversary of the guns on the Western Front, falling silent. The impression of the First World War are often tinged with shades of brown, from the sepia tint of old photographs and the flickering films, which were marking major achievements during the conflict such as the First Day of the Battle of the Somme, 1st July 1916, but also images of seemingly inescapable mud. Looking at the weather records, I tried to establish what kind of day it was on November 11th, 1918. It was a cool and wet autumn, where rain had swept across the UK and northern Europe, which obviously affected military operations. There is a wide interest in the state of the weather with the British public, on whether one should take a coat or umbrella and it seems that in Swansea it always rains! Weather reports date back to 1766, when the England and Wales Precipitation Series were first published. Back to remembrance. Swansea certainly does have some very interesting remembrance stories and not all from the First World War. I want to first go back to the Crimean War, 1853-56. Remembrances of these famous battles can be found in the street names of St. Thomas with Balaclava Street, Inkerman Street and Sebastopol Street. William Owen, 76, a veteran of the conflict, who received two Silver Medals and Clasps for bravery and one Long Service and Good Conduct Medal, was a Freemason of Swansea and a pilot. The South African War, other-wise known as the Boer War, 1899-1902 was where 53 ‘Swansea’ men were killed or died of diseases. Captain Richard Arthur Starling Benson, 1st Cold-stream Guards, died of dysentery at Wynberg Hospital, 19th February 1900, aged 30. He was the only son of the ‘mysterious’ Starling Benson who featured in my article about censuses in the February 2017 issue. You can read about him online at www.theswanseabay.co.uk – just put Starling Benson into the search box. 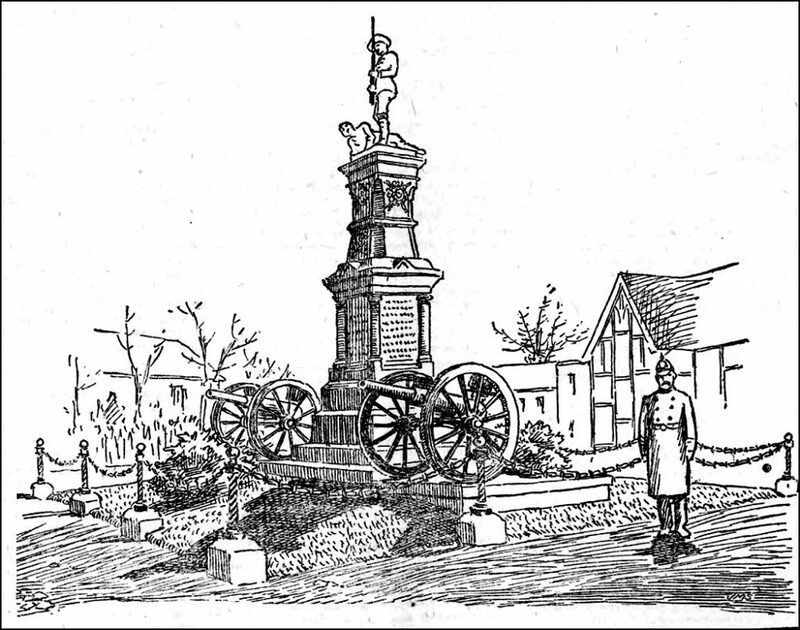 April 1904 saw the unveiling of the Swansea War Memorial in Victoria Park (Artist illustration left, dated 22nd April 1904, Cambrian Daily Newspapers), where the weather was glorious and there were immense crowds present. The memorial was paid for by public subscriptions. The unveiling was per-formed by the Mayor, Mr Griffith Thomas, because Lord Grenfell of Kilvey was unavailable to attend! Among the throng, were nearly a hundred old campaigners, displaying their medals and a few VC hold-ers. 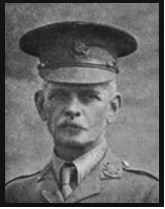 One veteran that is mentioned in the Cambrian article, is Private James Gilbert Betts, who saw 5 years of fighting through the Egyptian and South African Campaigns. The article also mentions a sad in-cident, where the daughter of the late Private Gowman, was wearing her father’s medals. The memorial was moved to its present site on the promenade during the 1930s to make way for the new Guildhall. One of those who served during WWI was Lieutenant Colonel Richard Erle Benson (pictured right), uncle of above mentioned R.A.S. Benson. He served with the East Yorkshire Regiment during the early days of the First World War and was killed in action during the Battle of Aisne, 29th September 1914. His body was brought back for burial at St George Church, Reynoldston. He was one of the last to be repatriated, during a time of war. Inside St George Church, is a memorial dedicated to the memory of Daniel James Taylor, who lost his life at the Battle of Coronel, Chile, 1st November 1914, whilst serving onboard the H.M.S. Good Hope. Anyone who has an army officer within the family can follow their progression through the ranks from the yearly Army Officer Lists. Records were kept from 1702, and first published in 1740. Remembrances can take many forms. 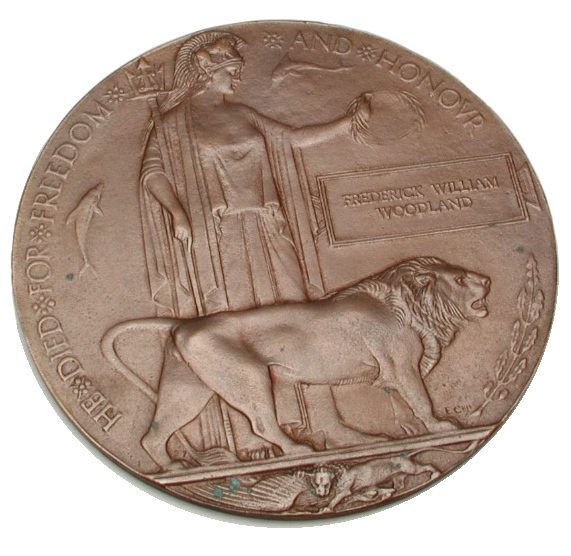 After the end of the First World War, the next-of-kin, were issued a Memorial Plaque, which became known as the “Dead Man’s Penny” (left), 1,335,000 were issued. The face of the coin bears the image of Britannia holding a trident standing with a lion. Around the picture the legend reads “HE DIED FOR FREEDOM AND HONOUR”, also bearing the deceased’s name. They turn up from time to time on internet auctions sites – ones issued to women are even rarer. If you have one, I’d be interested to see a picture of it if you’d like to email me. I’ll come back to medals later. Memorials are located in churches and other buildings around the city. The first memorial to be unveiled in Swansea, was at the former St Nicholas Church For Seaman in Gloucester Place, and was in memory of Owen Owen, the first of the Swansea dead. Sadly the memorial has since been lost. During 1928, the Royal British Legion organised its first Battlefield Pilgrimage, when 11,000 war veterans and war widows visited the battlefields. Even today, these tours are very popular. I have a Facebook page – Swansea War Dead – First World War where you will find daily posts on events from WW1. Bay designer/illustrator Simon Williams, saw a photograph of his great uncle, George Wilfred Imrie. His comment was “It was the first time that I’d see a photograph of George. I knew noth-ing about him or his history so I was chuffed to bits when you discovered him and found all the info about his life”. From Facebook, Mrs Sarah Smith “A poignant moment, this month as I saw for the first time a picture of my great uncle Archie Coode (pictured right). 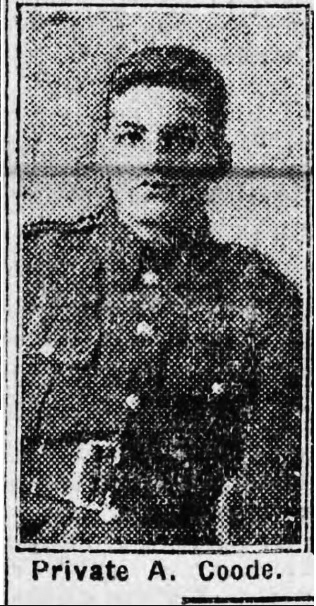 Heart-breaking, as I know he never returned home to his family” on seeing an article published in the Cambrian, dated 22nd September 1915. And finally medals. 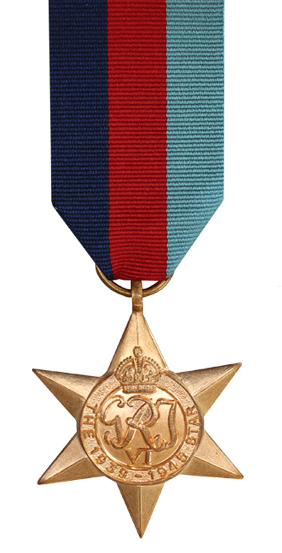 The common medals that were awarded during the 1920s, were 1914 Star/1914-15 Star, British War Medal and Victory Medal or known by their slang names as “Pip, Squeak and Wilfred”. The MOD Medal Office do not provide any replacement service for medals from the First World War. Purchasing replica medals is the next best option. Second World War medals, can be applied for, however certain criteria have to be met. If you meet the criteria, then an application form can be filled out and sent off along with the various pieces of documentation. Then all you need to do is sit back, forget about it and wait for a lovely surprise. 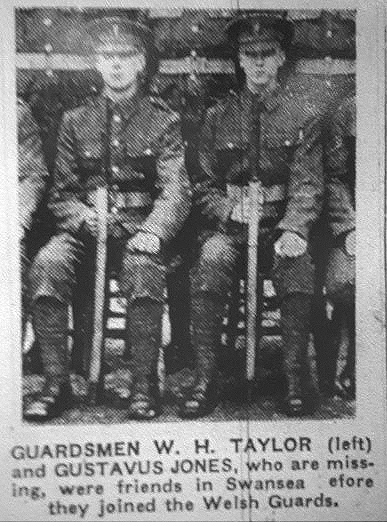 This was the case for John Jones, who applied for his late father, Gustavus Jones’ (left, from the South Wales Daily Post, 1940) medals. Gustavus was captured by the Germans and was a POW for the duration of the war. Earlier this year, he received the 1939-45 Star, and War Medal (right, kind permission Mr. John Jones) by Recorded Delivery. At this time of Remembrance, not only should we remember those who answered the call, and lost their lives in meaningless conflicts, but we should also remember those who are still serving with the armed forces. *Babell Graveyard was purchased last year by Richard Hopkins. He discovered that he had five generations of family buried there, and in order to ensure that the decon-secrated graveyard was never built on, he bought it at auction for £6,000. Work has started to clear the site of Japanese Knotweed and to make safe the gravestones. More information can be found at babell-chapel.com.